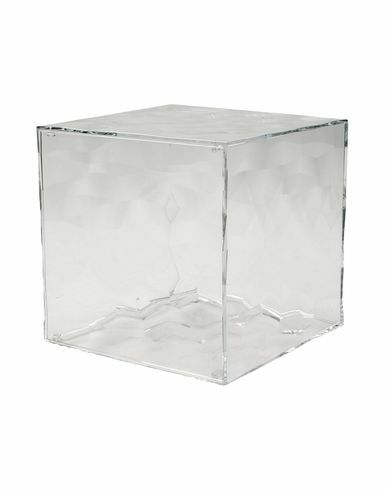 An exciting object: a cube with a multi-faceted transparent surface that creates a special ambience with its marvellous play of colours and the images it reflects. Optic is a container cube in PMMA which comes in two versions: closed with a door or with one open side. Its surface is strikingly decorated with square-based pyramids, slightly in relief, which, whether transparent or mirrored, create a strong visual impact. Optic offers a myriad of potential combinations whether by placing the cubes next to each other, by stacking them or by creating linear compositions. A graduate of the École Nationale Supérieure de Création Industrielle (ENSCI), designer Patrick Jouin founded his agency in the 11th arrondissement in Paris in 1998. From year to year and project to project—interior design, product and furniture design, exhibition design, and architecture—the agency has grown into a reference on the international stage. Patrick Jouin stands out through his elegant, clean style designed to serve the project: the quest for balance between tradition and innovation leads to luminous, enchanted designs.